Yesterday evening I had guests for dinner, I had already prepared all the plates except the dessert. It was late so I had to prepare something quickly. 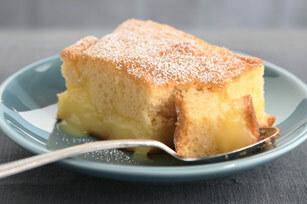 I soon gave a speedy look at Nonna Nada books of recipes and found this quick and easy one: Lemon Cake with Cream. Put all the ingredients in a nonstick pan, always turn it on a low flame until it boils and the lemon cream is ready. Mix all the ingredients for the pastry very well, using the mixer, or better by hand. Then put it in the oven at about 180 degrees for 30 minutes. Once it’s cooked, let it cool, then cut it in the middle horizontally, fill it with the lemon cream, and it’s ready! My guests said it was delicious!